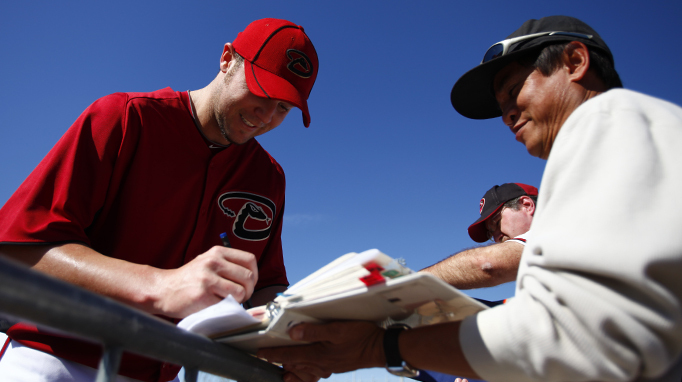 D-backs pitcher Micah Owings signed autographs for fans after workouts on Tuesday. As noted earlier, the D-backs agreed to terms with Kelly Johnson on a one-year deal to avoid arbitration. Towers said that the sides did not work on a multi-year deal, with the contract being strictly a one-year deal. This is Johnson’s last year as an arbitration-eligible player, so he would be a free agent at the end of this contract. When the D-backs signed Micah Owings to a minor league deal with an invitation to Spring Training, Towers said he expected Owings could be used as a batter in addition to pitching. Owings is already getting after it in Spring Training. On Tuesday, he took ground balls at first base, and on Wednesday he will throw a bullpen session. “He said, ‘I want to be ready for when the position players get here,'” Manager Kirk Gibson said. “He could be more of a bullpen guy, but if he can play some first base, he’s going to get some innings at first base in Spring Training. As valuable of a tool as he could be as a bat, Owings is primarily a pitcher. And his value to the D-backs is directly proportional to his value in the bullpen. Former D-backs reliever Mike Fetters and left-hander Ed Vosberg, a native Arizonan who pitched 10 seasons in the big leagues, were the instructors on the pick fields. “Those guys were very good,” Gibson said. “They understood it, it was an important part of their game and consequently they became very good at it. We know it can’t be a weapon for everybody, but is there one guy or two guys or five guys?